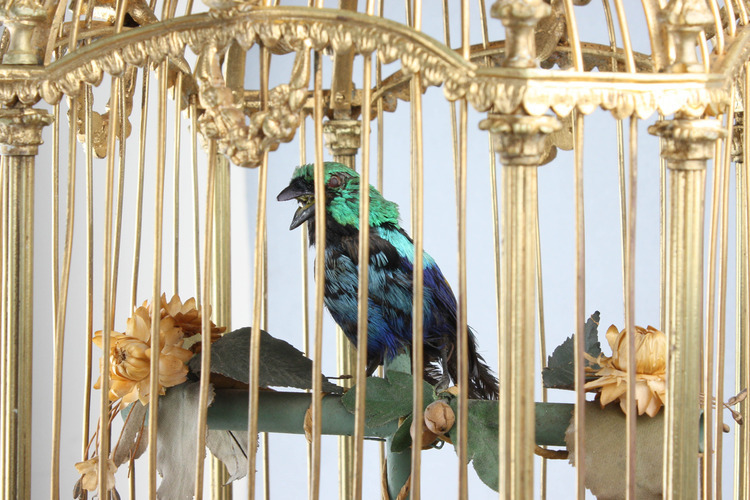 When wound with the key and start/stop lever actuated, the large and perfectly perched taxidermy bird begins to sing his chorus, moving naturalistic beak, tailfeather and head from side-to-side to the continuous birdsong. 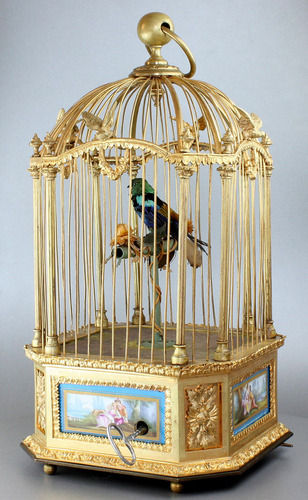 The volume of the birdsong controlled by side-positioned lever, scaled from loud to just audible with everything in-between. 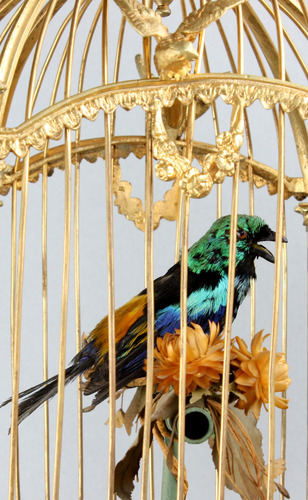 The full taxidermy bird with magnificent soft emerald green and electric blue toned feathered plumage, perched upon polished brass T bar perch, decorated with dried flower petals and twine trails, ivy leaves and stalks, dark green velvet covered base, under the magnificent architectural square domed cage with canted corners, with the hoop and boss top, eight branch bar arches with small circular bars in between, tooled arched band joining the top dome and the eight cupped urn finials atop the eight plunging fluted columns complimented beautifully by the outstretched bird-in-flight appliqués to band bar centres, petit floral swag drops underneath, on the substantial polished gilt bronze base with each canted corner bearing a stylised floral motif applique, plinth edge with fine acanthus leaf frieze, and the main focus of the eye being drawn to each side with inset rectangular Servres panels, with scenes of figures, mostly couples relaxing and enjoying the sights of the riverbank, the meadow and the foot of mountains, executed to astounding detail, finished with parcel gilt and blue borders, key entry to one corner of the side panel, base edge with cast wide egg-and-dart frieze, on bun feet. 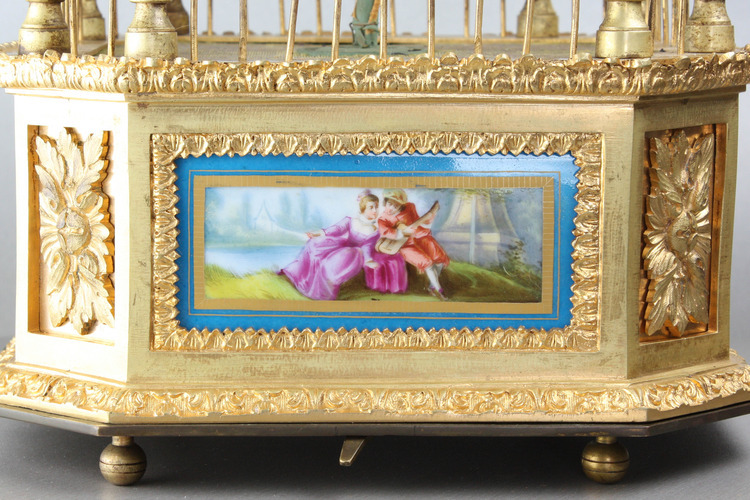 One of the most sought after and most looked forward to models ever made by Bontems, this example is offered in pristine original condition. The design of the volume control is genius. This is the first time the team at Douglas-Fisher have encountered something like this before. 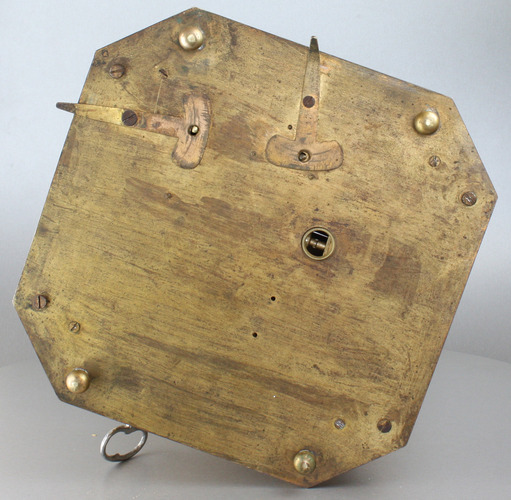 This fully original feature consists of a sprung rod which clamps over the top of the bellows reservoir. When set to loud/normal, the clamp is at its maximum height, to allow the chamber to fill with air which is expelled into the whistle. 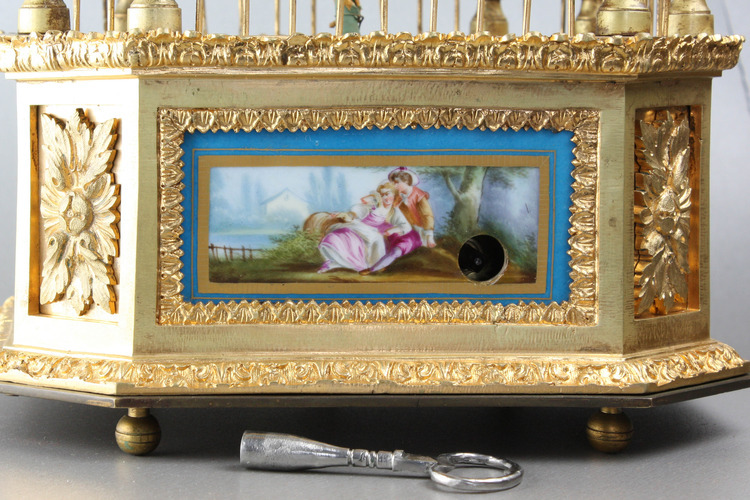 When set to quiet, the clamp pushes down restricting the chambers' capacity and with full variance in-between, this simple yet brillient device provides full control over the output of the sound. 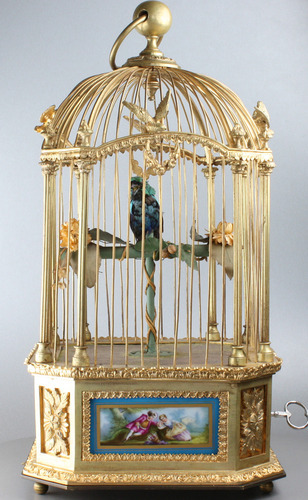 Gilt bronze singing bird cages, usually with stained glass, or fine porcelain panel inserts, were made in limited numbers during the 19th century to commission orders. 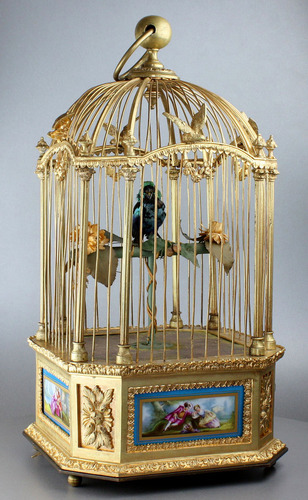 The first maker to offer a bird cage to this design was Jacquet Droz in about 1798 with his large singing bird in cage, fusee-driven with a clock to the underside so when hung up, its use was three-dimensional. 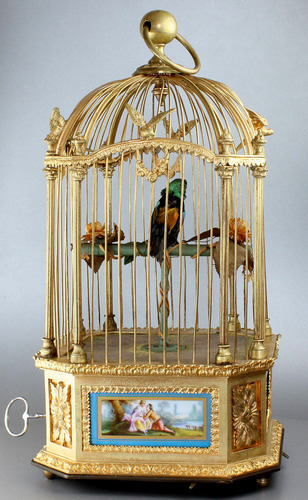 Bontems created this with the past in mind and was no doubt the only maker to undertake such a feat to this degree of quality. 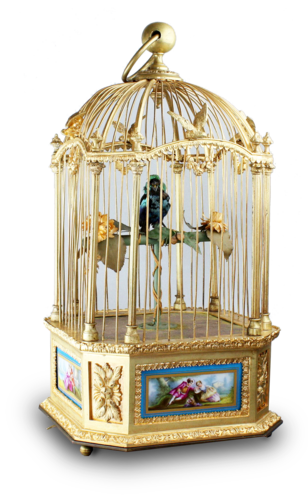 The castings and finish to each element of the cage is truly amazing - not a single part disappoints the eye of a top collector.Take a very good look at the acanthus leaf frieze at the base of the cage. 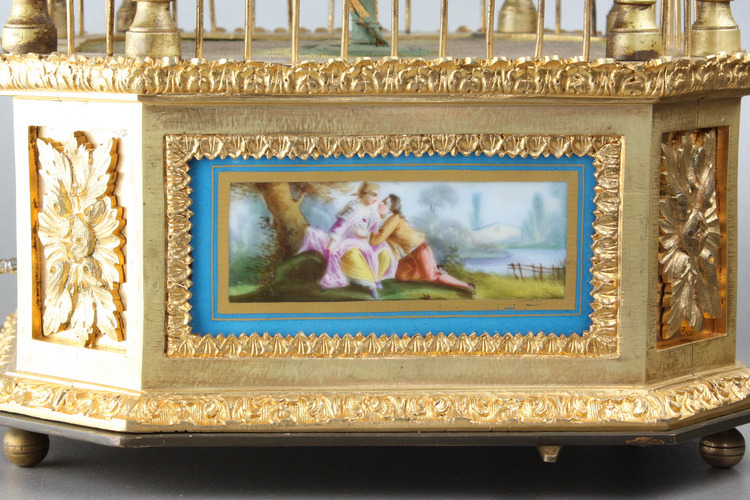 Very much the detail one would expect from a carved wooden example which the craftsman would have spend many hours getting to this level of accuracy. 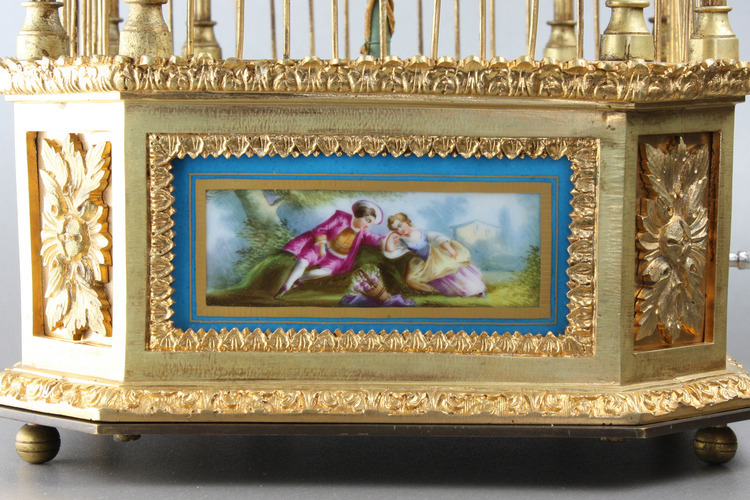 As good as fine painted enamel, the porcelain panels with that lovely blue border strike up the perfect colour choice to go with the richness of the gilded bronze. 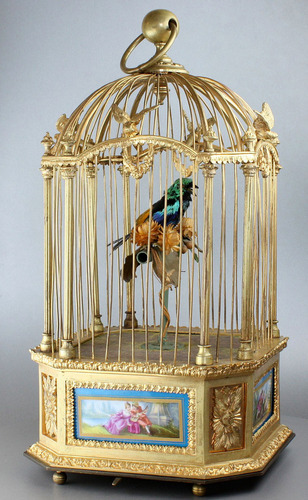 A singing bird cage of the highest order.